In the above photo, Katie incorporates fists into her normal Freestyle stroke. She focuses on grabbing and holding the water with her forearms instead of her hand while maintaining a 6 beat kick and breathing regularly. Fists Drill is a type of Sensitization Drill that can help a develop a better feel for the water. The surface area of your hands is greatly reduced when your hands are balled up in a fist, which forces the swimmer/ triathlete to focus on holding the water with their forearms. You may practice Fists Drill with any stroke, but in this post we are going to focus on Freestyle. The athlete may hold their hands in a tight fist or a loose fist, depending on their level of comfort. The athlete can also practice by wrapping their hand around a tennis ball or wearing fist gloves. Fists Drill is a great drill to practice before swimming DPS (distance per stroke) or sprinting because transitioning from swimming with your hands in a fist to swimming regular Freestyle will make you hypersensitive to the amount of water you’re holding and naturally encourages longer strokes. Hold your hands in a fist and swim Freestyle exactly the same as you would if your hands were not in a fist. In the above photo, Katie practices with her hands in a looser fist, which gives her hand a little more surface area than it would have if her fist was balled up tight. 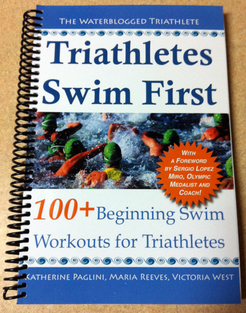 ‹ Can I Swim Backstroke During a Triathlon??? I find fist drills really difficult as I tend to feel as though I start to sink a little. Although agree that concentrating on DPS straight after makes you feel like you are moving through the water quite fast and smooth. I’m cautious to advise you to wear fins, I think you’ll improve faster if you practice it regularly and make an effort to really focus on catching and holding the water. One of my favorite combos is Fists/ Build/ Sprint 75s. It makes you feel like Superman!!! Great recommendation. I love doing fist drills and find that it really helps position my pull better. Sometime I’ll even go from fist drill and then immediately experiment a little with my hand and finger positions in my pull. You get such a great feel for the water doing them. So glad to see you’re already using them! It always amazes me how good I feel after practicing fists drill. It is such a simple way to start thinking about your hand position/feel.